This diagram comparing CPAP and Oral Appliance Therapy (OAT) was published in Current Opinion in Pulmonary Medicine (2009) in an article titled “Oral appliance treatment of obstructive sleep apnea: an update” by Andrew S.L. Chana and Peter A. Cistulli. (It can be found on page 594). 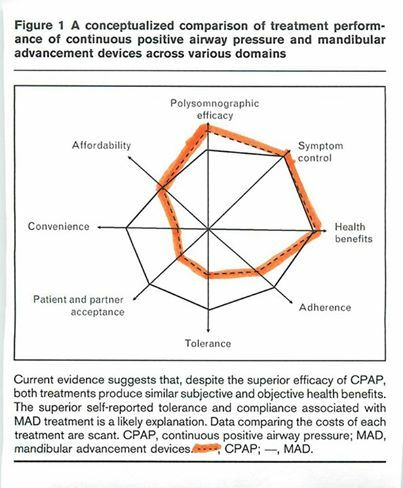 Despite the better PSG results, CPAP ranks lower on the convenience, patient/partner acceptance, tolerance and adherence elements. The dotted CPAP line has been highlighted in order to create a stronger visual contrast.